Sasha breaks down some pews for wood. Tyrese and Daryl pull apart the organ. Father Gabriel akss if they plan to take the cross too, but only if they need it. The windows outside are being boarded up. Rick can't go to Atlanta, but they want to get Carol back, Michonne will go. Gabriel continues to be haunted by past sins. Rick says goodbye to Judith, leaving her with Michonne and Carl. That baby is about as safe as she can be, but she's still not happy. Carl and Michonne board up the door, locking them inside with Gabriel. Gabriel scratches at a bloodstain on the floor desperately trying to erase it. The group heads to retrieve Beth and Carol. Tyrese knows the pain that Sasha is feeling, but she doesn't want to talk about Bob yet, she's not ready. At the hospital, Beth goes to check in on Carol. She lets the doctor through, and leaves without a word. Glenn sits with the road ahead. Tara tries to wake up Eugene. No one knows that they're there, and the fire engine is now empty. Glenn wonders if they should go back to the church, but Maggie fears that will only make things worse. Rosita tries a little hard love, and to try to get Abraham to drink, but he rises menacingly. Maggie warns him to sit down, or that she'll put him down, and Abraham complies. Rick lays out a plan to get inside the hospital. They need to go in quiet and utilize their upperhand. Rick thinks if they strike fast then they can get them outnumbered. Noah knows that the wards will be on their side a well. Tyrese thinks that the plan won't work, there are too many variables that can go wrong. He thinks that capturing a few and doing a trade would be less risky, and less likely to end in a firefight. Rick is sure that his plan will work, fast and effective. Daryl likes Tyrese's plan better. If Officer Dawn is barely holding onto control, then taking a few of her officers will force her to release Beth and Carol without any violence. That's assuming she's sane, but everyone in this world have proven otherwise, and Rick understands that. Gabriel continues to scrub away at the floor. Carl offers a distraction, to help him defend himself. Gabriel cannot think of murdering anyone else, like they did the Termites. Carl points out that they had no choice, it was kill or be killed. They live in a world that they have to keep moving, no place is safe for long. Gabriel isn't cut out for that world. He goes to lie down. Beth listens in on Dawn and another officer's plan. They haven't really had any leads on Noah, they're waiting for him to mess up. The officer thinks that they should take Carol off life support. Beth protests. It doesn't take much electricity to keep the ventilators on, no more than what he uses everyday to charge his DVD player. Dawn tells Beth to turn off the machine and take Carol off Dr. Edwards's rotation, if she pulls through on her own, so be it. Beth is upset, but the officer is pleased and leaves. Dawn tells Beth its up to her to save Carol, but she can't rescind her order. They're peace is in constant jeopardy, and she needs to put on a hard front to maintain order. She gives Beth a key to drugs and supplies she never trusted Edwards with. She thought Beth was weak, but she's proven that she isn't. Dawn gets news of gunshots in the distance and sends a patrol to check it out. There's a creek nearby, so they can at least get some water. Maggie stays behind with Abraham while Tara, Rosita and Glenn head for water. Tara talks to the walkers nonchalantly, and Rosita doesn't like it. The hard truth was that Eugene had one skill, and he used it to keep living. Maggie takes down the ladder and puts it in place over the front of the truck and covers it with a blanket to give Eugene some shade. Maggie tells Abraham that he isn't the only one that lost something today, that it isn't going to get better like this as he sits in the middle of the street still. Beth goes to see Dr. Edwards. She asks him what medicine he would give the woman in exam room 2 if he could. Dr. Edwards suspects that Beth has the key, but he warns her that if Dawn gave her the key it wasn't out of kindness. He gives her the name of the medication to give Carol the best chance, and wishes her luck. The stream proves to be murky. Tara wonders if upstream would be clearer. Rosita fashions a natural filter, Eugene taught her this. It'll clear up the water, and then they can boil it. They ask about her back story. She wasn't always with Abraham. He found her in that big truck of his, and then Eugene asked for her help. It was the first time that happened, and she went to help save the world. Glenn spots a fish in the water. A female officer and a male officer follow the sounds of Noah's gun fire, and run him down. She thought Noah was smarter, as they cuff Noah. Rick signals them from behind. He talks really slow, lets them know that they won't be hurt if they cooperate. The man asks if Rick was a cop, he can tell because of his demeanor, and he was once a cop as well. Another car comes up from behind, and rescues the officers. So much for the element of surprise. They manage to get away, but they take on heavy fire from Rick's group. Rick and the others give chase, the car didn't' make it too far with walker rumble all over the place. They spot the cuffed officers and hurry forward, all except Daryl who is looking for the driver. He combs over the car, before heading to the destroyed FEMA trailer. As he looks in the driving officer tackles Daryl from the side. The officer holds him down as a burnt walker crawls near. Daryl uses another walker's head to beat back the walker before Rick comes to the rescue. 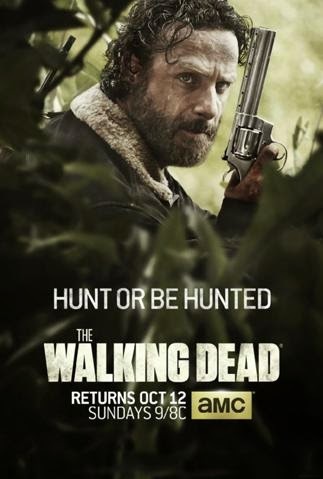 Rick holds him in the crosshairs, and only Daryl's soft words keep him from shooting the officer in the face. It didn't go down how they were expecting, but they have their hostage. Rick's group take their two officers hostages to a warehouse. The woman tells them that Rick's plan is going to get them killed. The plan would work if they had different cops to trade. Dawn is in charge, but she's running the group into the ground, and they're ready for new management. She thinks that Dawn will know that they're looking at a replacement already. They're even willing to take care of Dawn themselves, but the other cop tells her that they aren't willing to do that, and he needs her to shut up. He tells them that they can make it work, but they need to be able to talk to her. He's known her for a long time, and a peaceful resolution is all he wants. Glenn, Tara and Rosita kill the stuck walkers and stripe them of their clothes to find anything of use. Glenn and Rosita manage to catch a fish. Rosita knows how to clean the fish, and Glenn offers her a place with them no matter where they wind up. Tara finds something in the walker backpack. Michonne checks on Father Gabriel, worried about him. She knows that everything is new to him, but she wanted to tell him, that the things that they do, are worth it. He already took the machete, and he wants to know what more that she wants from him. She doesn't want anything from him, she just wants to help. He thanks her and closes his door. In his room he has a few boards already pulled from the floor, and he uses the machete to pull loose another. Beth sneaks a man some strawberries, and he begins choking. As the officers run to help him, she gets the medication that she needs from the cabinent. He sees her pass, and his fit stops. Beth heads straight to Carol's room and administers the Epinephrine. She tells Carol that she's there, but Carol remains asleep. Tyrese keeps watch while Sasha looks through the contents of the trunk. Sasha catches her sleeve on a crowbar and rips it. She throws it down in anger. Tyrese has some things to say, and she's going to listen. She got the chance to say goodbye to Bob, he felt her love. Sasha thinks that she should have been the one to deliver his doubletap, but Tyrese points out that she still wouldn't have been able to say goodbye, that she let him help her. Father Gabriel crawls out of the floor boards in the church and gets out. Outside, he immediately steps on a nail, which goes through his shoe. He pulls out the nail, and hobbles away. The officer tells Rick that Dawn says that she won't make a deal, that she won't compromise, but that she will. No matter what he needs to remember who he's talking to. Rick asks him if he needs anything else, he only asks for water. Rick gives the okay, and he tells him that his name is Bob, which catches Sasha's attention. Rick appreciates his integrity, sees that he's still a cop, but Bob knows he isn't anymore. Father Gabriel scurries off into the woods, and has a run in with a walker. He does what he has to to survive, and practically body slams the female zombie. Gabriel lifts a rock to finish her, but hesitates when he sees her cross. He can't bring himself to bring it crashing down. Sasha brings Bob #2 the water. He tells her that he will be okay. When they were bringing him back up there, he saw one of the rotters and he knew. He was set to drive out one of the last group of walkers, but Dawn pulled him off that mission at the last minute, instead the man he knew was among the undead. Sasha tells him to let her help him. She wants him to tell her where he is. Maggie continues to watch Abraham, who is still kneeling in the road. She offers him some water, but he doesn't answer her. She asks if he wanted her to shoot him. He thought he did, but he didn't. Maggie leaves the water, and they hear Eugene stir. Maggie rushes to check on him, and Abraham picks up the bottle. The more Glenn thinks about things, maybe it wasn't a complete waste of time. They head back with their water, and fish. At the warehouse, Sasha takes Bob out to a window where he can see his fallen friend. He points him out, and Sasha takes aim. She asks if he's sure that's him, and Bob smashes Sasha against the window before making a run for it. So much for closure.